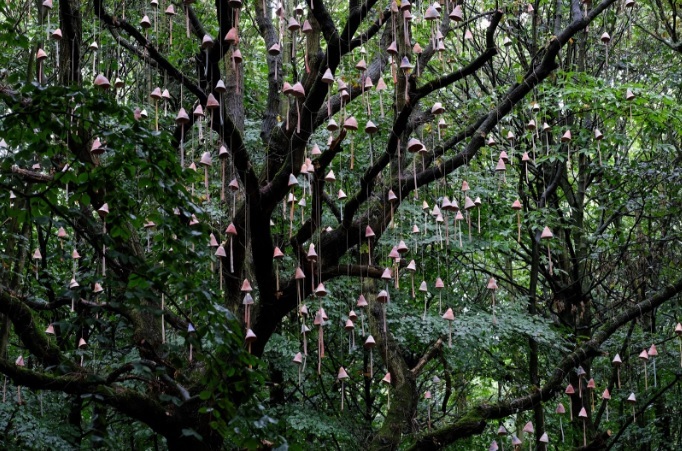 Set in Speke Hall’s ancient woodlands and grounds, 300 ceramic mushrooms adorn an ancient tree in Serena Korda’s The Bell Tree installation and soundscape. This new sculpture comprising of ceramics and an audio track explores the spirit of this ancient site and the power of myth embodied in this most protected of English flowers. Inspired by the folklore that surrounds the native bluebells that grow beneath its branches, The Bell Tree celebrates the dark side of the fairy kingdom. The soundscape that forms part of The Bell Tree (which can be listened to on the National Trust website) transforms you into a nature spirit. Stand in front of The Bell Tree, watch the bells move in the breeze and then, through listening to the audio on your phone, immerse yourself in the ringing of bluebells played by the bell ringers of Garston St. Michael’s Church. These melodic sounds are accompanied by an angry band of fairies, performed by local choir Mostly Madrigals and a capella group Mouthful. The public commission is at Speke Hall, with a smaller element installed in Bluecoat’s garden. Speke Hall is free to visit with a National Trust Membership.